Pros of being an Athlete Mom # 2: No time for pre-race jitters to hit you! | Move fast. Think slow. 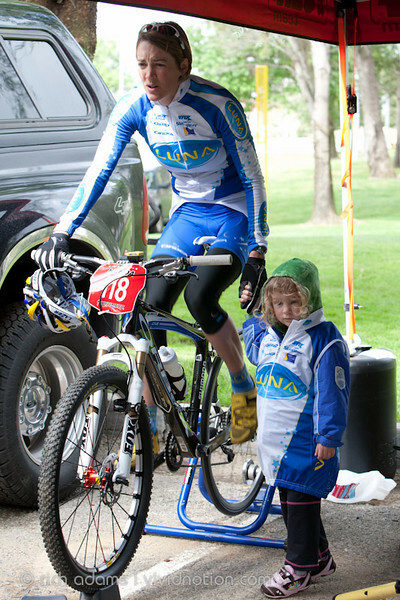 Pros of being an Athlete Mom # 2: No time for pre-race jitters to hit you! “Wow, I’m suddenly on the start line – how did I get here so fast?” or “Oh, I’m racing, time to get going!” have been all too common thoughts since I’ve been racing with kids in tow. While I’ve never considered myself an overly nervous racer or very prone to pre-race jitters, the any waves of nervous butterflies I used to feel on race morning have almost been nonexistent since I first came back to racing 6 months after Zoe was born. Not that butterflies are bad – they are getting your body “UP” and ready to race, I just haven’t been able to pay them much attention anymore! 1. Staying focused on what is in your control. When I think about the day before a race and the morning of a race these days I’m so busy getting my equipment ready on top of feeding and organizing my family, that race weekends allow no time to dwell on anything outside of my control like the weather, the competitors, what could go wrong, any doubts over my readiness to race etc. So I just stay focused on my race before and after the gun goes off. 2. Having a routine to follow. Race routines with kids have taken some trial and error. For one Xterra race in 2009 that JF and Zoe traveled with me to I was the last one to set up my transition and barely made it to the swim start line on time! It was scary, and now my pre-race routine checklist always allows for as much time as possible to get everything done and get in a decent warm-up which is always a plus, ha! Following a routine I know works will allow me to focus my best once the race begins. Of course, “mom race routines” have to be flexible and add some “go with the flow” room too! 3. Keeping emotions in check. Like most athletes I know I start to get a little edgy as a race approaches. And my family will be the first to notice me getting a little more impatient for example as a race approaches. However, kids remind me not to take myself or my races too seriously, they keep bringing me back to the present moment, and keep me laughing right up until it is time to focus on the race – and for me that is when the warm-up starts! And since I find that little daily joys with kids by far trump the emotional highs and lows of competitive sport, they keep my perspective in check too! 4. Staying in the here and now. As related to all of the above, children are amazing teachers at how to live in the present! They don’t care if I have a race in an hour – they are hungry now! Or need a diaper change now! Or just want some mommy attention now! They can have a temper tantrum one minute and being showering you with hugs and kisses the next, they don’t hold grudges or worry about what will come tomorrow. They teach me to enjoy every moment before, during, and after a race. During the race I can focus 100% and it is my time to do so. Before and after the race I can allow myself focus 100% on everything else! Overall, although bringing my family to races can definitely take my stress level up in a negative direction at times, most of the time they are a positive distraction in the sense that they keep me busy enough to stay focused on just one thing at a time, and in the present moment, a practice that is also a positive for racing, to focus on taking it lap by lap, or section by section, until voila, I’m across the finish line and back to being a mom again! This entry was posted in Mental Perspectives and tagged athlete-mom tips, performance anxiety by Danelle Kabush. Bookmark the permalink.